Another showdown is shaping up today in a development controversy that has some North Baltimore residents angry at their own community leaders – and at their freshman City Council representative. A council committee is hearing a bill that paves the way for a developer to build a six story, 148-unit apartment building behind Belvedere Towers at the corner of Northern Parkway and Falls Road. Opponents have reserved buses for the noontime City Hall hearing on a project that had the fur flying last month when a crowd of nearly 200 people gathered at the Radisson at Cross Keys to discuss it. “The Overlook at Belvedere,” many said, would destroy wildlife habitat, worsen traffic back-ups at an already famously-congested intersection and dominate the landscape, standing 30 feet higher than Belvedere Towers. The bill, sponsored by 5th District Councilman Isaac “Yitzy” Schleifer, would allow developer Jonathan Ehrenfeld to build the 75-foot tall apartment tower in an R-6 zone as a Planned Unit Development (PUD). Under the new city-wide “Transform” zoning overhaul that went into effect Monday, structures in R-6 zones must stay within a 35-foot height limit. But Ehrenfeld is seeking to use the PUD, essentially a variance that requires City Council approval, to allow the project to be grandfathered in under old zoning that permits heights as great as 80 feet. “There are no compelling reasons to circumvent the intent of the Transform Baltimore Zoning,” organizers argue in their “Stop the PUD” website. Yellow-and-black signs have sprung up in North Baltimore calling on Schleifer to withdraw the bill and pause plans for a project opponents refer to with their own disparaging nickname. “Yitzy, stop Belvedere 2,” the signs on lawns and roadsides say. The 12-acre parcel east of Belvedere Towers where Ehrenfeld hopes to build was under a 50-year covenant that limited development to a 100-unit building. But that covenant expired in 2013. Ehrenfeld bought the Belvedere Towers property last July 1 for $30.2 million. Online records show he took out a $25.7 million mortgage from Keybank. The parcel was technically purchased by Northern Falls Investors LLC which is controlled by Ehrenfeld, president of Blue Ocean Realty in Northwest Baltimore. 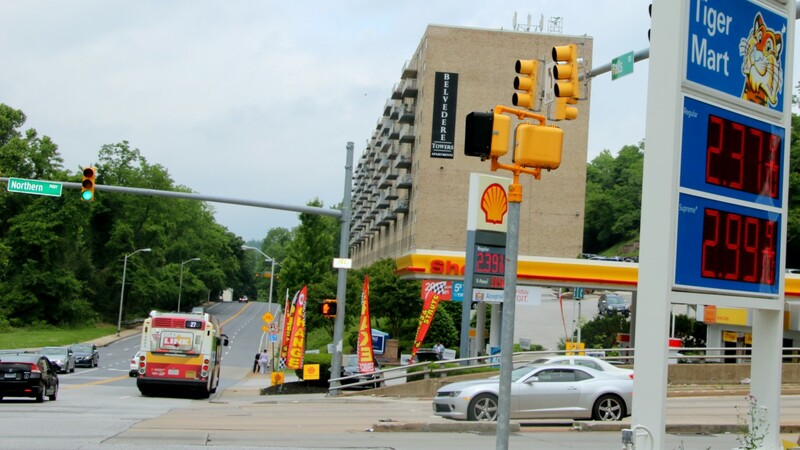 Since the Planning Commission’s May 4 approval of the the “Overlook at Roland Park” the project has grown in size. Plans at that time called for a 132-unit building with parking for 190-200 cars. Now Ehrenfeld wants 148 units with 214 parking spaces. But anger exploded across the room – at Sehnert and at the leaders of the Poplar Hill Association – as audience members said they were never consulted before letters of support for the PUD were sent to the Planning Commission. Schleifer and other group leaders said multiple meetings were held over the past few months about the project. Several property owners, angry about what they regard as their association leadership’s lack of transparency, have broken away and formed the Lehr Stream Neighborhood Association. But residents grilled Schleifer, 27, about his relationship with Ehrenfeld, asking how much his campaign received in contributions from the Northwest Baltimore real estate executive. Perhaps more significant were the fundraisers Ehrenfeld participated in or headlined in the years before and after Schleifer’s 2016 election victory. 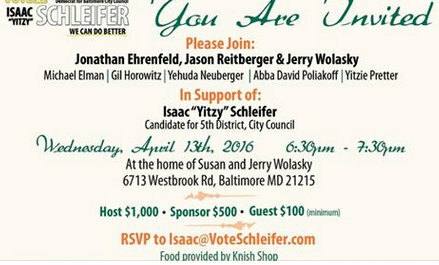 • On June 2, 2015, Yona Ehrenfeld was one of the sponsors of a fundraiser for Schleifer’s Democratic State Central Committee bid. Over 100 people, including Lt. Gov. Anthony Brown, attended the fundraiser, held at the home of Baltimore Jewish Council president Abba Poliakoff. • In February 2016, ahead of Schleifer’s victory in the April Primary, Jonathan Ehrenfeld was “the primary host” of a “VIP reception” at the Milbrook Banquet Hall. 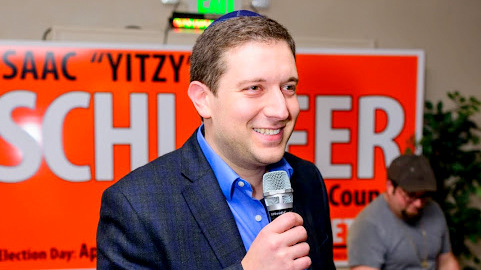 “Yitzy is the candidate we need at this time in our city’s history,” Ehrenfeld told the gathering of 150 “powerhouse attendees,” as Baltimore Jewish Life described the event. At last month’s meeting, Schleifer pushed back on the suggestion that he introduced City Council Bill 17-0049 as a favor for a financial backer.